Quick question for you, have you seen Dr Horrible's Sing Along Blog? No? Go do so now, it is 42 minutes of pure awesome, I promise you won't regret it. It is free on youtube, here. Go on, I'll wait. 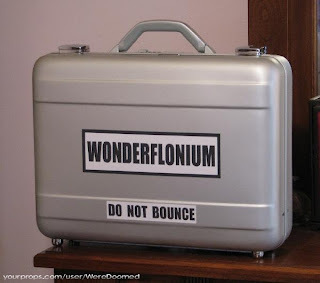 Every super villain who ever aspired to the Evil League of Evil knows this one important piece of information: the wonderflonium must never be bounced. But here's a helpful reminder in case you forget. The suitcase of wonderflonium that Dr Horrible stole to power his freeze ray. And, as an aside, if I could draw I would totally draw Jon Snow from Game of Thrones doing battle with Neil Patrick Harris in a park. Made me chuckle anyway. Quick, Hawaii-ise my teddy bear! Bear bread, rabbit rolls and turtle pizza.